Why Am I Giving Away 10,000 Pieces of Azeztulite? I love Azeztulite, in all its variety of colors, shapes and beautiful vibrations. 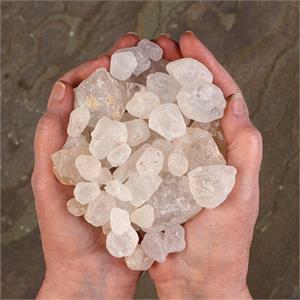 Among the entire mineral kingdom, I have not encountered another stone that activates so much inner Light. I have watched literally thousands of people connect with Azeztulite, and the experience is unfailingly positive, and frequently profound. I relish the magical moments when I witness someone holding an Azeztulite and gradually (or suddenly) feeling its gentle yet powerful energies sweep through him or her. I have spent over twenty years seeking out Azeztulites in different forms, and in different parts of the world. My wife and I even moved from the USA to New Zealand, at least in part, to be among the wonderful Sauralite Azeztulites found in that lovely country. Our company, Heaven and Earth, offers all the types of Azeztulite, in raw and polished form, jewelry, beads, spheres, wands, hearts and faceted gems. So why would I want to give 10,000 of them away? It’s because I saw a vision. Around the first of December, 2017, I was sitting in meditation when the vision came. I suddenly saw an image of the Earth, as if I were looking down from a high orbit. I could see the entire sphere of the planet. Most of the Earth looked dark, not because it was night, but because of what might be called “polluted energies.” It was as if most of the earth was blanked with clouds, but they were black rather than white, like vast atmospheric wastelands of smoke. It was a troubling sight. I kept my eyes closed and stayed with the inner vision. As I continued to look, I noticed more details. I was asking myself, “Is the Earth entirely dark now? Is that what I am seeing? Then I began to notice tiny points of light, like sparks of incandescent white scattered here and there. Somehow I knew that these were not the lights of cities, but points of spiritual Light, just as the dark clouds were not actually smoke, but signified the troubled energies that are so prevalent in our world. I shivered, and felt a current of energy move up my spine. Light entered my own head, and as I watched the vision, I saw, to my surprise, the southern portion of the subcontinent of India emerging from beneath the dark clouds. As I focused on it, an intense, and much larger point of Light began to glow there, getting larger and larger, glowing with ever-increasing intensity. Next there came a sudden burst from that center of Light, and glowing rays of White Light exploded out from it in all directions. It looked rather like the explosion of a skyrocket in a fireworks display, except that the Light did not fade. Instead, the streams flew further and further from South India, traveling all over the Earth. I could see that many of the streams seemed to descend to the ground, and then to explode again, like the first time, sending our more and more streams of Light. They began on the land masses, but soon I could see streams of Light falling into the oceans, lakes and rivers, illuminating them as well. There was a deep feeling of recognition in my heart as I contemplated the image. It seemed to actually enter my heart, and the illumined Earth’s rays filled me. Sorrow and joy mixed together in my heart, and I was filled with two emotions–gratitude and urgency. My reasons for the gratitude were simple–I had just had a powerful spiritual experience, and the inner Light is always accompanied by an ecstatic feeling. However, I also felt that I knew that the vision was one of possibility, not certainty. And I felt sure that I understood why the word “Azez” was spoken, and why South India was the originating source of the spreading Light. After the vision subsided and I could function again, I thought about the meaning. To me, it was clear that the spreading Light was the Nameless Light of the Azez, and the fact that it originated in South India meant that the stone which was shown to be carrying that Light all around the world was Satyaloka Azeztulite. I understood that the vision showed many, many sparks going from South India in all directions, and that this indicated that many, many pieces of these stones would have to be dispersed. As it happens, I have been collecting Azeztulites for more than twenty years, so I have a lot of pieces. Heaven and Earth has been selling them for two decades. But the feeling of urgency has to do with time. The pivotal moment of the spiritual evolution of ourselves and our planet seems to be bearing down fast. If that is true, and if Satyaloka Azeztulite has a role to play in the spreading of the Light, then many more stones need to be dispersed. That seems to mean that I need to give a lot of them away. It was a little bit of a shock to realize that, but, oh well. Why not? I certainly couldn’t think of a more worthy cause! So I checked intuitively for the right number, and for now at least, it feels like it’s about 10,000 stones. Our staff in Vermont has been selecting and preparing them, and we began the giveaway program at the Tucson Show last February. If you feel resonance with this vision and want to participate, please write us and let us know you are willing to help. 1) We ask you to agree to plant one of the three stones in the ground, at a place of your choosing. Create a little ritual or ceremony in which you imagine and affirm that in planting the stone you are holding the intent that it will bring spiritual Light to the land. 2) We ask you to agree to drop one of the stones into a body of water of your choosing–ocean, lake, pond, river or stream. As you do this, create another ritual or ceremony in which you envision spiritual Light pervading the body of water, and affirm that in giving this stone to the waters, you hold the intent that it will bring spiritual Light to all the waters of the Earth. 3) You keep one stone for yourself, and you meditate with it at least once (more is better, of course), and in your meditation envision the spiritual Light filling you, and spreading until it fills all people, all the land, all the waters, and all the Earth, from its core to its corona. If you already have your own piece of Satyaloka Azeztulite, you can, if you choose, give it to someone else. But I hope you will meditate with it at least once. We ask that these gifted stones not be sold or used for other purposes, and we trust those who accept them to abide by this. In my own mind, I am sure the majority of people will go along with this request, and I feel it will probably be helpful for the stones to go out into the world, even if some people do not. And certainly, we invite anyone attracted to Satyaloka Azeztulite to purchase other pieces of it from us, in any of the many forms we offer. But that is not what this initiative is about. If you have read this far, I must tell you now that I feel a bit of uncertainty in sharing this vision, even though I know that I must. Some people may reject it, or may simply not understand. Nonetheless, I am committed to following the vision I had, and hoping that doing so will help. I can’t say how much this may increase the Light in us, or in the world, and I am certainly not trying to claim that Azeztulite will save the planet. I would sure hope so, but who can say? What I do know is that these stones emanate very powerful and wonderful vibrations of Light, which those sensitive to stone energies can readily feel. My studies have also shown me that our intention is a very powerful co-creative influence on the way events unfold in the world. And I have learned that stones can lend their power to our capacity to manifest our spiritual aspirations, especially if we choose stones which naturally align with what we want to do. These are the things that give me hope, and I believe most of us would agree that a major shift of consciousness is needed in the world now. NOTE: You'll notice at the top of the page that there is a charge for shipping if you'd like the FREE Azeztulite gift without placing an order with us. We are happy to provide the 10,000 stones as FREE gifts, but we ask that those who want them pay the shipping charges. Otherwise a project of this size would be too expensive for us. Each person who requests this gift (if they are willing to contribute the postage) will receive the three stones and a set of suggestions for creating one’s own ritual. If you wish to purchase more sets to give away to others, we’ll offer those to you for a contribution of $5 per set. If you are already placing an online order with us, you do not need to select anything above, simply check the box "YES send me 3 FREE Satyaloka Azeztulites ..." at checkout and they will be inlcuded in your shipment. We will continue to give away the Azeztulites for this project until all 10,000 pieces have gone out. Our deepest gratitude to all the Light Workers who join in this co-creation. May the Earth become a Planet of Light!